To make to make these cute campfire cupcakes, preheat your oven to 350 degrees and line a cupcake pan with cupcake liners. Using a standing mixer, combine the cake mix, butter, milk and eggs and mix on medium speed until well combined. Next, scoop the batter ¾ of the way into the cupcake liners and bake for 21 minutes. Once the cupcakes are done, pull them out of the oven and set aside to cool. Using your standing mixer, combine the butter, powdered sugar vanilla and heavy whipping cream. Mix the ingredients until stiff peaks form. Next, scoop some frosting into 2 bowls, 1 bowl for for the yellow frosting and 1 for the orange frosting, leaving some of the frosting in the main bowl to frost the base of the cupcakes. In a small bowl, combine the graham cracker crumbs and cocoa powder, and mix until combined. Add 2 mini marshmallows to each tooth pick (about 12) and set them aside. Using a butter knife, frost the top of the cupcake using frosting left from the main bowl. Once frosted, dip the cupcakes into the cocoa and graham cracker mixture. Using a spoon, scoop some of the yellow frosting into 1 side of the piping bag and scoop the orange frosting into the other side. In the middle of the cupcake pipe a small star to create your flame. To create the “wood” around your campfire, cut some of the the mini pretzel sticks in half and place around the “fire”. We used about 4-5 sticks, but place as many as you desire. 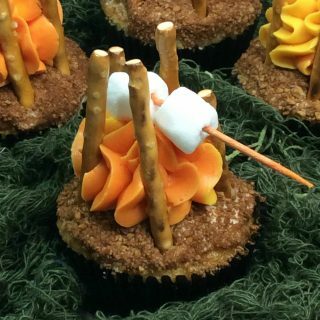 Then add your marshmallow sticks to the top of your campfire cupcake and enjoy!